Every solution starts with a problem and Caloundra City Private School’s problem was how were they going to provide seating for hundreds of students, staff, parents and teachers in their new multi-purpose hall? Not only that, but how were they going to store all that seating as well as set it up and pack it down fast? 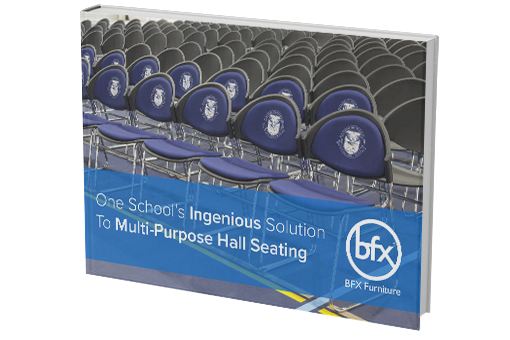 The school and BFX Furniture worked together to come up with an amazing solution to all their problems. But the end result would be even better than they expected. I love the way the furniture looks. We have never had any furniture even remotely like it in our library before, and the students are thrilled. Thank you both for your professionalism and rapid responses to any questions I have had. BFX has been a pleasure to deal with and I am sure that is due in large part to you and all the team.. Thank you for walking beside us as we chose the furniture for our new Resource Centre and Hall. The furniture is functional, and the bright colours make a positive impact on the learning environment. Essentially, BFX “got” our vision for creating 21st Century Learning Environments, and were of invaluable assistance in the detail of achieving this vision. The students who were involved in designing their space developed their academic and learning skills.